If you’re like me, then you’re probably interested in seeing how things change over time. Say, for instance… a Jeep. Today’s post will satisfy the first one. The next post will be filled with updated pictures of our now 4-month-old puppy, Tenor. 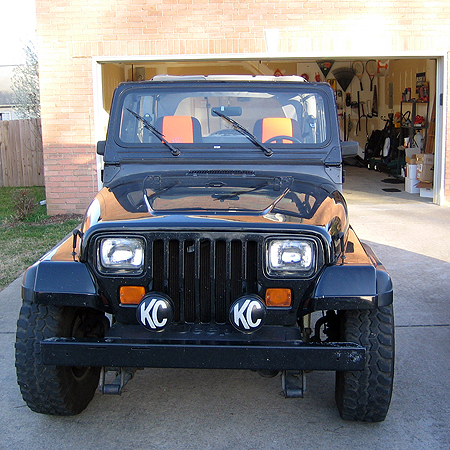 Our friend, Steve (who bought our 1990 Jeep YJ when we got the new 2004 Jeep Wrangler Unlimited) sent us an e-mail the other day with an update on all the add-ons and enhancements he’s done to ‘ol Scruffy. Just thought you guys might like an update on all the goings on with the black Jeep. You know some of this, because I asked your opinion. But since today I had the top off and such, I figured it was time to take a few pics. I promised this update about my Jeep. I check out your web site now and then for a check up on yours. 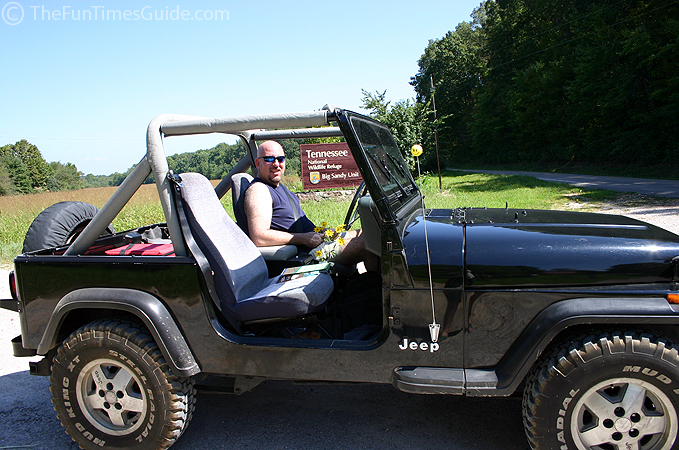 Hope all is well, and here’s to an awesome spring and summer with the DOORS OFF!!! Looks GOOD Steve… Thanks for the update. This happened about 6 months ago… I had been noticing a strange rotation issue with the left front tire on the Jeep. The treads were wearing funny, and there was a louder than normal sound from the road. I took it into my usual tire company on a Saturday morning. They checked out the tire and rotated them for me. The diagnosis was possible mis-alignment. So I went on my way thinking they had helped/fixed the problem. I drove the thing all day Saturday, and all day Sunday, when… at about 10 p.m. on Sunday, I was on I-24, slowing down to take the exit … when … in a split second, my LEFT FRONT TIRE FELL OFF! I was driving about 60 mph, and the sounds of metal grinding and the sight of sparks flying higher than the Jeep were pretty scary. I would say 3 wheeling is like driving on ice! But I was able to get it to the side of the road. After we figured that we were not hurt, and thanked Jesus that we didn’t flip over, we called the local PD. Three minutes later we heard the sounds of cars wrecking on the other side of the interstate. By the time the local cop was there to help, a state trooper showed up on the scene. He said… “I found your tire”. I was in the right hand lane, and the tire and wheel had crossed 4 lanes on my side, then jumped the retainer wall and came to rest in the center lane of westbound traffic. A couple cars had slight damage, but nobody was hurt. The trooper said that because the tire had come to rest before they hit it, I wouldn’t be included in the official report. WOW. I got a tow truck to get my Jeep the mile to my house ($85). The lost tire and wheel were never recovered. Once in my driveway, I noticed something about the rotor. The SPACER was gone too. When I contacted the tire company that had helped me on Saturday, they were more than willing to help me out. They covered the cost of the new tire and wheel, and new rotor, and didn’t charge me. They had neglected to check the spacer on Saturday morning, and they now have a policy that if they see spacers on a vehicle, they will not work on it. Spacer failure was the issue, and I removed the remaining 3. My turning radius is less now than before, but it’s all good.